← Congratulations Week 02-03-14 Giveaway Winners! Editorial Note to my Readers: I’ve decided to shake up the interview questions a bit for 2014 so you, my reader, can get to know the highlighted author a bit more beyond their genre and book release dates. I’m not even going to run the same questions each week. I hope you have fun reading the author’s answers! I’ve always had a good imagination. I would make up stories about people sitting at a table across a restaurant or in a passing car. I always thought I’d write a book someday. Contemporary romance, Romantic Suspense and Women’s Fiction. The world building. For me, the setting is just as much a character as the people in the stories. From everyday living. I live in a small town and I love hearing the stories from the folks around here. I also watch a lot of television. You just never know when something is going to spin a tale in my mind. That’s a better question for my readers! Maybe that my stories don’t follow the rules. I just write from my heart. It may not always be perfect, but I hope it will always be entertaining. I’m totally an avid reader!! I have just as many digital books as I do paperbacks these days. I always read contemporary books, but my I really enjoy many types of stories from romances by Debbie Macomber and Jill Shalvis, to stories from Carl Hiaasen, Mary Kay Andrews or Fanny Flagg and I’m a huge Nicholas Sparks fan, too. Mint Juleps and Justice just released on 2/1. It’s the fifth book in the Adams Grove series. BE SURE TO COME BACK to read more about Nancy and her release, MINT JULEPS AND JUSTICE, on Wednesday’s Karen’s Killer Book Bench!! Happy Reading! 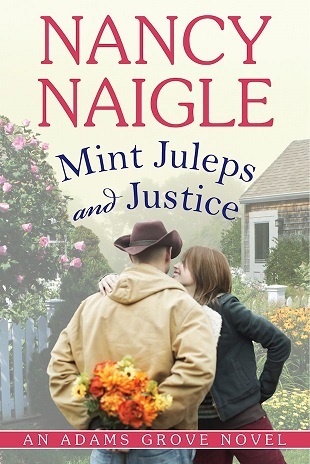 **SPECIAL ANNOUNCEMENT: Nancy will give away a print copy of her book, MINT JULEPS AND JUSTICE (U.S. only) to one of her lucky readers who comments on her Monday Interview or Wednesday Book Bench blogs!! Don’t miss this chance to read this story!! Thanks, Nancy, for sharing your stories with us! Love the cover, Nancy! I look forward to reading it! How many books are planned for the Adams Grove series? Thanks for stopping by. There are currently 5 books in the Adams Grove series with at least one more novel to come. Love Nancy’s books. If you want to read her books start with Sweet Tea and Secrets.. Her books are filled with love and suspense. Great books to give as gifts. Enjoyable interview. Learning about the author is lovely and gives me insight into her writing. best wishes. Great interview! Congrats on the new release, Nancy! That is a beautiful book cover. This is on my TBR list! I agree with you about the setting being as much a character as the people . Towns and settings are great when they are fleshed out. I lived in a small town when I was younger and I did get an up close view of people and interactions. It is a great place to get story ideas.